choir croak out them goodies: Who doesn't love doing stuff? Who doesn't love doing stuff? Not related to music, but there are a couple of things happening this month that have the potential to be sort of brilliant, if only you let them by showing up. 1. On April 25 and 26, UCLA will be hosting the Los Angeles Times Festival of Books, for which tickets will be a mere 75 cents, available April 19. The two-day event is to include panels on topics ranging from various writing styles to the publishing industry (including a possibly worthwhile Saturday panel on publishing, moderated by former LA Weekly editor-in-chief Kit Rachlis, as well as appearances by Ray Bradbury and S.E. Hinton, and a media panel that includes Arianna Huffington and the Weekly's Marc Cooper...hrm.). 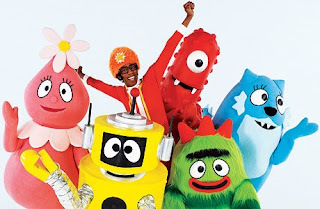 The real fun, though, is in the schedule of outdoor staged events, which presently includes Yeardley Smith, Yo Gabba Gabba! (with D.J. Lance Rock in the flesh! ), Tori Spelling, Jon Sciezka and Bob Barker. Too good to be true? 2. If you live in L.A., Dining Out for Life is on April 30; this year, at least 25% of your restaurant bill from a list of participating restaurants will go to Project Angel Food, a really fantastic organization that prepares and delivers food to L.A. residents with HIV/AIDS and other serious illnesses. This organization's sort of dear to my heart, so if you can't make it out to one of the restaurants, help 'em out by volunteering or donating directly. They're good people, and there is a scarily high number of people in this city who are living with HIV and need the assistance. And for the musical goodies: Goodtimes Goodtimes has a couple of new songs available at his website. The Twilight Sad is finally coming back to America to open for Mogwai on tour (though, as luck would have it, the goddamned west coast goes ignored). Greg Ashley's also coming out of hiding to tour (though he - a California resident, even - is also ignoring the west coast). Support 'em all! And, of course, Record Store Day is April 18 - go support your local record store and buy physical albums! If you live in L.A., make the rounds by heading here, here, here, here and here. That is outrageous. All festivals should be 75 cents!